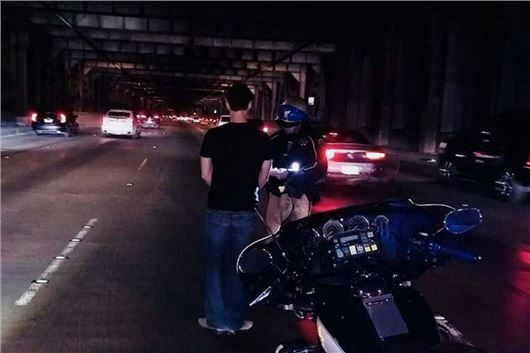 The driver, who was discovered to be over twice the legal limit, was apparently passed out in the stopped car while stuck in traffic on San Fransisco's Bay Bridge at 5:30pm, according to the California Highway Patrol. Once he was awoken, the man assured the police it was fine because he'd set the car to autopilot. Unsurprisingly, he was promptly arrested and charged with suspicion of Driving Under the Influence. The 'self-driving' capability of a Tesla allows the car to steer, change lanes, control braking and even parallel park itself. But, despite these impressive features, the car is not fully autonomous. The current incarnation of autopilot on Tesla vehicles will not simply take unresponsive drivers on their merry way. Drivers have to touch the steering wheel at least once every two minutes for autopilot to remain on. If this doesn't happen, the car will slow down and eventually come to a stop. It's fair to assume that this is what happened to this intoxicated driver while he sat in bumper to bumper traffic. Tesla has previously mentioned that autopilot is "intended for use only with a fully attentive driver," reminding drivers that they are still responsible for, and ultimately in control of, the car. Fortunately, no one was injured in this case. But that’s not always the outcome. In 2016, a man in Florida was killed while using the semi-autonomous driving system on a 2015 Tesla Model S.
Setting the speed at 10 miles over the speed limit, he kept his hands off the wheel for extended periods of time, ignoring automated warnings not to do so. Neither the driver nor the car detected a truck moving into their lane. It was the first fatal accident involving a partially autonomous car.